The evolution of plants and animals generally has been thought to occur through the passing of genes from parent to offspring and genetic modifications that happen along the way. However, the new research has documented another avenue, through the passing of genes from plant to plant between species with only a distant ancestral kinship. How this happened is unclear but the researchers show that not only did a grouping of grasses pass on enzymes key to photosynthesis multiple times over millions of years, but that some of the genes that were transferred became integral cogs to the plants’ photosynthetic machinery. This is a critical distinguishing feature in C4 plants, which dominate in hot, tropical climes and now make up 20 per cent of the earth’s vegetational covering. “As far as we know, this is the first case where nuclear genes that have been transmitted between plants have been incorporated into the primary metabolism and contributed to the evolution of a new trait, in this case C4 photosynthesis,” said Pascal-Antoine Christin, a postdoctoral researcher in the Department of Ecology and Evolutionary Biology at Brown University. In a paper published today (16 February 2012) in Current Biology, the researchers from Sheffield, Brown and other universities in the United States, United Kingdom, and France investigated the ancestry of two genes encoding enzymes important in C4 photosynthesis — phosphoenolpyruvate carboxylase (ppc) and phosphoenolpyruvate carboxykinase (pck) — and these enzymes’ historical presence and function in a common and well-studied grass, Alloteropsis. The biologists initially studied the genes in closely related species, three C4 plants (Alloteropsis angusta, Alloteropsis cimicina, and Alloteropsis semialata) and one C3 plant (Alloteropsis eckloniana). The goal was to learn the evolutionary history of the ppc and pck genes, which were present in their C3 common ancestor and were thought to have been adapted to aid in photosynthesis in the offspring C4 plants. “People were wondering how these genes evolved. The global assumption was that an ancestor had the genes, but they weren’t involved in photosynthesis, and so were later modified to become C4 photosynthetic agents,” said Christin, the paper’s corresponding author. To test the hypothesis, the scientists took a wider view, surveying C4 plants in which the ppc enzyme was integral to photosynthesis and plants where the enzyme was present but had no photosynthetic role. They figured the ppc enzymes used in C4 photosynthesis would be closely related to the non-photosynthetic genes from closely related C3 plants, given their common ancestry. Instead, the ppc genes involved in C4 photosynthesis were closely related to ppc genes of other C4 species with no close relation in the phylogeny, or family tree. Closer analysis also revealed these plants sharing photosynthetic ppc enzymes had diverged as many as 20 million years ago; the new finding is that despite these ancestral divergences, they exchanged genes. In all, the researchers documented four instances in which the ppc enzyme or the pck enzyme found in the Alloteropsis C4 plants popped up in other C4 clades – Andropogoneae, Cenchrinae and Melinidinae. 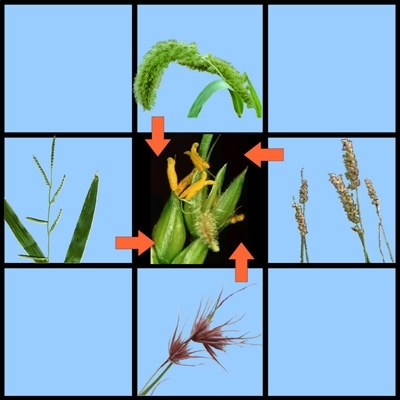 These clades include such diverse species as corn, foxtail millet, and guinea grass. “What is so exciting here is that these genes are moving from plant to plant in a way we have not seen before,” said Erika Edwards, Assistant Professor of Biology at Brown University and the second author on the paper. "There is no host-parasite relationship between these plants, which is usually what we see in this kind of gene movement." Scientists call this evolutionary event “lateral gene transfer.” The question is, how are the plants passing their genes? At this point, the researchers presume that genetic material carried airborne in pollen grains land on a different species and a small subset of genes somehow get taken up by the host plant during fertilization. The team think gene-swapping among plants continues today which means that plants can adapt to new environments by taking genes from others. Dr Osborne added: “It seems pretty unlikely this is an isolated phenomenon - we've just been able to pick it up in these plants because they're so well studied."